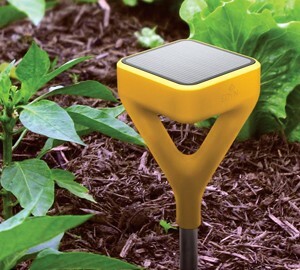 Edyn is the latest innovation in high-tech gardening. The smart sensor is completely solar powered and will track environmental conditions like temperature, light and humidity as well as soil conditions. The device is web enabled so it can send its data to the cloud to be viewed from anywhere. Edyn will also send notifications to a smartphone through a mobile app to alert gardeners of conditions that may harm their plants. The data readings are used by the sensor and Edyn cloud to determine what plants will thrive. It will also give information and advice for taking care of specific plants that are chosen. Edyn also comes with an automated watering system that will work with most existing hoses and sprinkler systems. It is also web enabled and will use data from the sensor to determine when and how much to water. This prevents wasted water and keeps plants from wilting even through the hottest of summers. Make any garden a high-tech, cloud-based data monitoring system with Edyn.